This is my first Limited Edition range. Birds play an important role in the Shona and Ndebele cultures of Zimbabwe. Because of their ability to reach great heights, birds are associated with divinity and the spiritual world, and are believed to act as ancestral links to the heavens. The national symbol of Zimbabwe is the iconic stone-carved Zimbabwe Bird, which was found at the national monument site of Great Zimbabwe, and dates back many thousands of years. Each buckle in the ‘Birds of the Lowveld’ range is a tribute to the birds that surrounded me as I grew up in Zimbabwe. These all have their own story and hold a special memory for me. 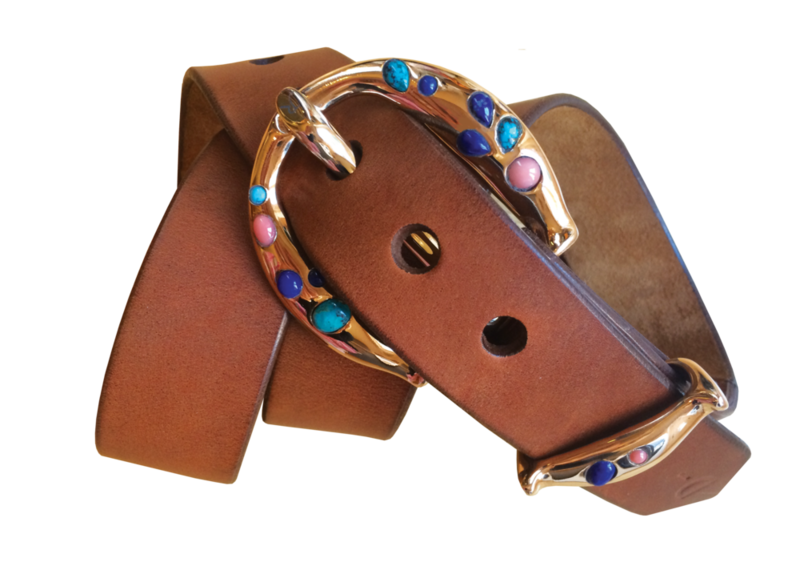 I have tried to convey their vibrancy through the use of specially selected, coloured cabochon gemstones, each of which brings its own energy and significance to your Limited Edition buckle. From the print on the Carmine Bee-Eater stationary, right down to the choice of stone, I have personally designed each detail to bring you an exclusively handcrafted, sophisticated product that combines and celebrates skilled craftsmanship and the exotic beauty of the African bush. I have set each stone by hand, so the setting may vary slightly, adding to the charm. Each buckle is made to order, should you be interested in purchasing one of the Limited Edition range, please click below to drop me an email.